We had discussed three Single Input Multiple Output (SIMO also known as receive diversity) schemes – Selection combining , Equal Gain Combining , Maximal Ratio Combining and a Multiple Input Single Output (MISO, also known as transmit diversity) scheme – Alamouti 2×1 STBC. 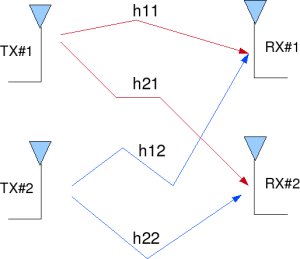 Let us now discuss the case where there a multiple transmit antennas and multiple receive antennas resulting in the formation of a Multiple Input Multiple Output (MIMO) channel. In this post, we will restrict our discussion to a 2 transmit 2 receive antenna case (resulting in a 2×2 MIMO channel). 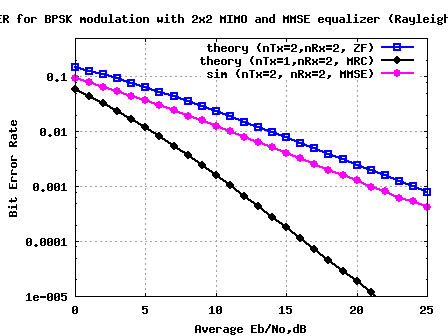 We will assume that the channel is a flat fading Rayleigh multipath channel  and the modulation is BPSK. Having said this, some of you will wonder – the two transmitted symbols interfered with each other. Can we ever separate the two out? The rest of the post attempts to answer this question. We assume that the receiver knows , , and . The receiver also knows and . The unknown s are and . Two equations and two unknowns. Can we solve it? Answer is YES. This matrix is also known as the pseudo inverse  for a general m x n matrix. Note that the off diagonal terms in the matrix are not zero (Recall: The off diagonal terms where zero in Alamouti 2×1 STBC  case). Because the off diagonal terms are not zero, the zero forcing equalizer tries to null out the interfering terms when performing the equalization, i.e when solving for the interference from is tried to be nulled and vice versa. While doing so, there can be amplification of noise. Hence Zero Forcing equalizer is not the best possible equalizer to do the job. However, it is simple and reasonably easy to implement. Further, it can be seen that, following zero forcing equalization, the channel for symbol transmitted from each spatial dimension (space is antenna) is a like a 1×1 Rayleigh fading channel (Refer Section 3.3 of [WIRELESS-TSE, VISWANATH]  ). Hence the BER for 2×2 MIMO channel in Rayleigh fading with Zero Forcing equalization is same as the BER derived for a 1×1 channel in Rayleigh fading. (f) Repeat for multiple values of and plot the simulation and theoretical results. 1. 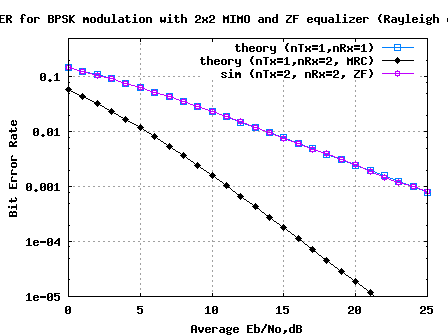 As expected, the simulated results with a 2×2 MIMO system using BPSK modulation in Rayleigh channel is showing matching results as obtained in for a 1×1 system for BPSK modulation in Rayleigh channel. 2. 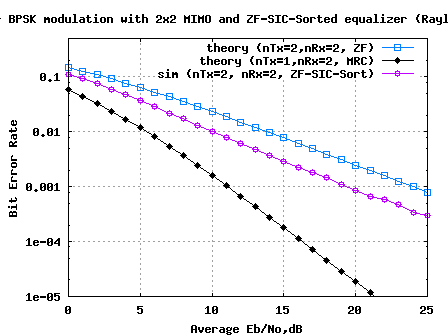 As noted in Section 3.3 of [WIRELESS-TSE, VISWANATH]  , the Zero Forcing equalizer is not the best possible way to equalize the received symbol. 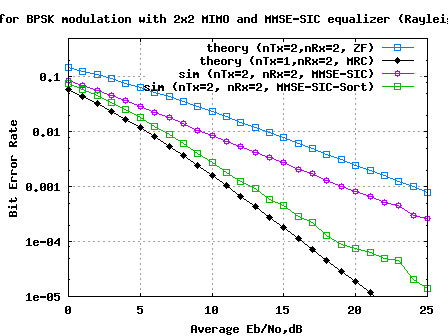 The zero forcing equalizer helps us to achieve the data rate gain, but NOT take advantage of diversity gain (as we have two receive antennas). 3. We might not be able to achieve the two fold data rate improvement in all channel conditions. It can so happen that channels are correlated (the coefficients are almost the same). Hence we might not be able to solve for the two unknown transmitted symbols even if we have two received symbols. 4. It is claimed that there can be receiver structures which enables us to have both diversity gain and data rate gain. In future posts, the attempt will be to discuss receiver structures which hopefully enables us to find out approaches which will help us to keep the data rate gain, but still move from the 1×1 curve to 1×2 MRC curve.